The sticky rolls are a great twist on cinnamon rolls. I'm a pretty big fan of cinnamon rolls and sticky buns and pretty much anything with frosting. Can you tell? I saw there over on The Kitchn and knew I had to make them. 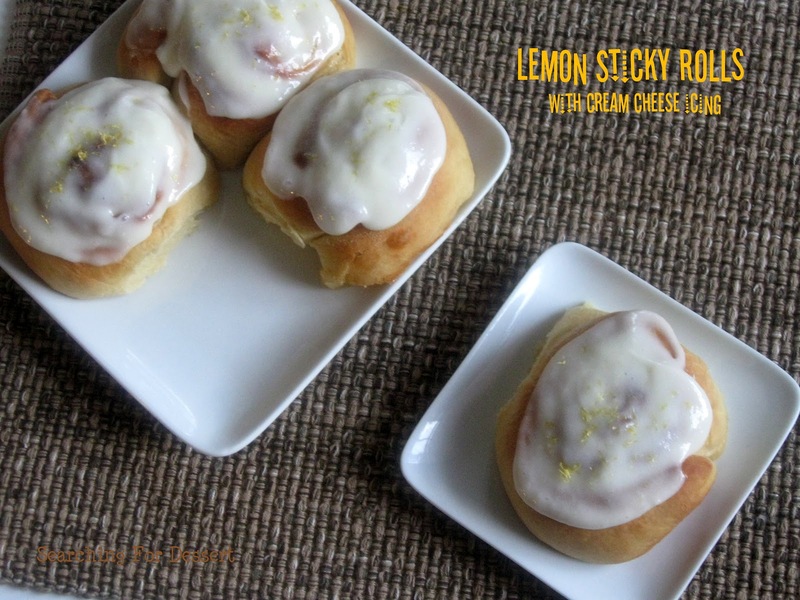 We love lemon in this house and these sound delicious are so delicious. I cut down the recipe so that it only makes four but feel free to double or triple it if you need more or just want more :). There are only two and a half of us (although sometimes the half eats like a whole :), he ate three waffles yesterday morning for breakfast - who knows where he puts it) so as you know I like to cut recipes down to smaller sizes. They are big enough to fill up an 8" x 8" pan to give you an idea of their size. Are you ready for all of this lemon goodness? This isn't a quick recipe because it has yeast but you can make it up to a certain point then pop it in the refrigerator and pull it out in the morning. Then all you have to do is let it rise one more time then pop it in the oven and it's a fairly quick morning process. If you're feeling wild you could also use oranges instead of lemons but I don't think I would go lime unless you really really like lime :). Maybe it would be reminiscent of a key lime pie with the cream cheese icing, now that I think about it, those might be good. Maybe another day. 1. Prepare the lemon: Zest and juice the lemon. Divide the zest into three equal parts. One part will be used in the dough, a second part in the filling, and the final part will be sprinkled on top of the baked rolls for appearance and flavor. Divide the juice into two equal parts, and set aside. 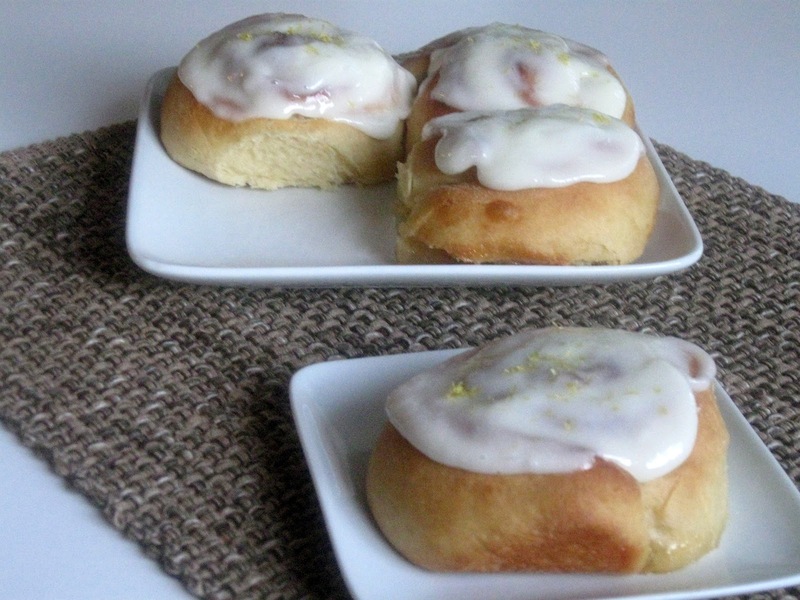 Half of the lemon juice will be used in the lemon-sugar filling for the rolls. The other half will be used in the glaze. 2. Make the dough: In the bowl of a stand mixer sprinkle the yeast over the warmed milk and let it sit for a few minutes or until foamy. With the mixer paddle, stir the softened butter, brown sugar, vanilla, and ⅓ cup of the flour into this milk and yeast mixture. Stir in the salt, nutmeg, and one part (1/3) of the lemon zest. 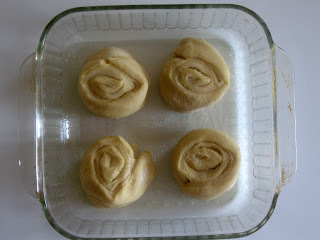 Stir in the egg and enough of the remaining flour to make a soft yet sticky dough. 4. Lightly grease the top of the dough with vegetable oil, and turn the dough over so it is coated in oil. Cover the bowl with plastic wrap and a towel and let the dough rise until nearly doubled — about one hour. 6. Assemble the rolls: Lightly grease a 8x8-inch baking dish with baking spray or butter. On a floured surface pat the dough out into a large yet still thick rectangle — about 5” x 10”. Spread the dough evenly with 1 tablespoon of very soft unsalted butter, then spread the lemon-sugar mixture over top. Roll the dough up tightly, starting from the top long end. Stretch and pull the dough taut as you roll, to keep the lemon sugar firm inside. Cut the long dough roll into 4 even rolls. Pinch the bottom of each roll closed to help keep the lemon sugar inside, and place each one, open and cut side up, in the prepared baking dish. 8. Heat the oven to 350°F. 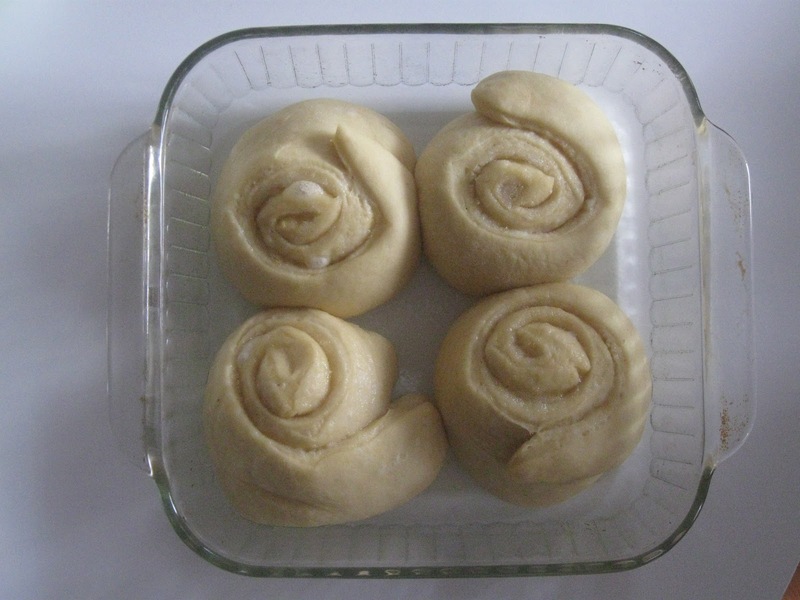 Place the risen rolls in the oven and bake for 30-35 minutes or until a thermometer inserted into a center roll reads 190°F. 9. 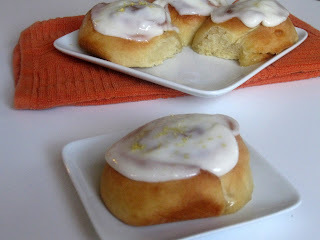 Make the glaze: While the rolls are baking, prepare the glaze. In a small food processor (or with a mixer, or a sturdy whisk), whip the cream cheese until light and fluffy. Add the remaining part lemon juice and blend until well combined. Add the powdered sugar and blend until smooth and creamy. 10. Finish the rolls: When the rolls are done, smear them with the cream cheese glaze, and sprinkle the final part (1/3) of the lemon zest over top to garnish. Let cool for at least 10 minutes before serving, but do serve while still warm.